Is it possible to be good and be good for business? New York Times syndicated columnist and professor Jeffrey Seglin shows that making responsible business decisions requires the ability to examine their impact from three important aspects: money, people and the common good. Seglin helps managers navigate the grey area that constitutes the majority of business decisions. Jeffrey L. Seglin writes "The Right Thing," a weekly column on general ethics syndicated by the New York Times. 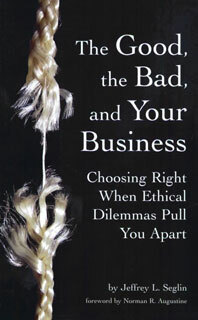 Finally—a book about modern ethics and business that you don’t have to get all dressed up to read! . . . It’s flat-out superb.” Nancy K. Austin, coauthor, A Passion for Excellence.